My friend was getting nervous... And I should have seen it coming. I have a number of interests in private businesses. One I'm particularly excited about is a consumer-products startup that will put its products on shelves in the coming months. I brought a younger friend along with me as an investor. When we received a quarterly financial statement from management, my friend sent me a worried text: "Hey Doc, this startup you've got me invested in is really burning through our capital." My bet is a lot of you think like my young mentee. You're experienced enough to know you want to see a lot of sales coming in. You want to see big margins, a sturdy balance sheet, and a lot of cash flow coming in the door to reward shareholders. And that's not wrong. Those are hallmarks of an excellent business. When it comes to a startup like this, though... the rules change a bit. In this case, I'm not worried. "That's what capital is for," I told my friend. Most great businesses use capital efficiently. If you can sell $1 million worth of software that you coded on your own at virtually no cost, that's stellar. If you need to build a $5 million factory to sell $1 million of products, you are in for a rough ride. But sometimes, you've got to build. A business takes capital, builds something with it, and tries to earn enough to pay it all back and then some. That's where finance and business come together. With our startup, we're building up a big production facility and distribution network... And we've got to do it before the sales come anywhere close to covering costs. We want this company to burn through our capital and turn it into a sustainable business. As a private investor in early companies, you learn that almost all the money flows one way. Electric-car maker Tesla (TSLA) is burning up capital right now. It's making a bet that it will be able to borrow more and eventually sell enough cars to turn profitable before it goes broke. Streaming giant Netflix (NFLX) is doing the same thing, but with TV shows instead of cars. Why would anyone own these stocks? They expect the capital investments made today to turn into real, money-producing assets in the future. When it's done right – by a trustworthy management team with the right experience – today's spending turns into future results. Now, I'm not saying you should go out and buy shares of Tesla or Netflix today. But if you pay close attention to a business, you can find windows when the capital expenditures are easing – and the money is about to come rolling in. In August 2015, we recommended shares of aircraft builder Boeing (BA) to subscribers of my Retirement Millionaire newsletter. So far, even after you take out the legacy costs, Boeing still loses money on each 787 it produces. It costs more to build one than the company can sell it for. But Boeing's 787 program is about to turn a corner. The 787 program was a massive undertaking that has set Boeing up to dominate commercial airlines for decades. Now, Boeing can focus on returning cash to shareholders through dividends and share buybacks. And that's exactly how it played out. 787 orders came in strong. The company turned massively profitable, and subscribers who followed our advice more than doubled their money in a little less than three years. In conclusion, it's hard to "time the markets"... But you can time the fundamentals. With my private startup investment, we can't afford to wait for this kind of moment. The stock doesn't trade publicly, so we either get in early or we don't get in at all. But it's a great strategy for the public markets. Since you can buy into publicly traded securities at any time, you can simply wait for the capital spending to slow. Then, instead of watching the capital roll out... you can join at the right moment and watch it roll in. Editor's note: Doc has discovered an important financial loophole you don't want to miss out on. It's a little-known strategy that has helped everyday Americans generate thousands of dollars every month... And the best part is, you can gain approval to start collecting this extra income in 15 minutes or less. For more details, including how it works and how to get started, check out Doc's presentation right here. "Being contrarian pays when you're an investor," Doc writes. Last month, he shared three rules for successful contrarian investing. Read them here. Another one of our favorite strategies is buying companies that are what we call "capital efficient." As Porter explains, it's "the secret behind super-high-quality stocks that get better and better over time." Read more here: Why I Lost Interest in Deep Value Investing. 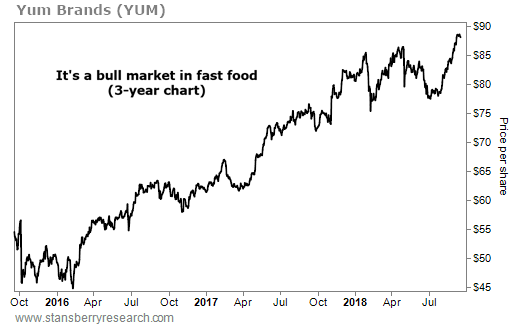 Yum Brands (YUM) is a $28 billion company known for popular fast-food chains KFC, Pizza Hut, and Taco Bell. Altogether, it has around 45,000 restaurant locations in more than 140 countries. In the second quarter, Yum’s revenues jumped more than 50% over the same period a year ago. Plus, Yum has partnered with mobile-ordering app Grubhub (GRUB) to deliver many of its favorite menu items right to your front door.